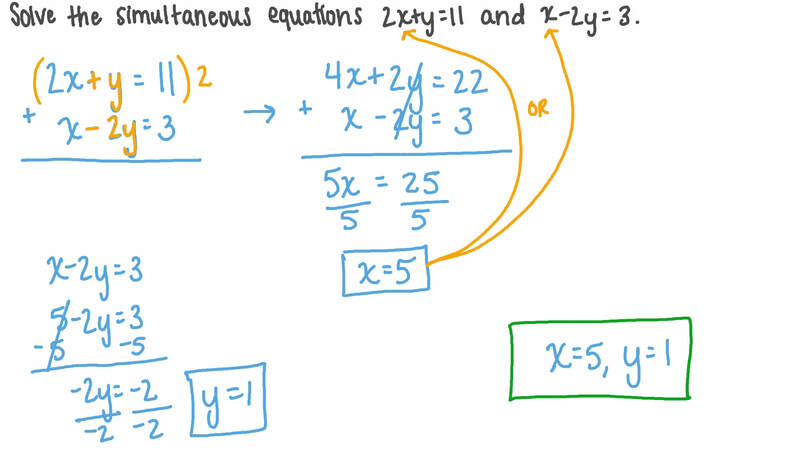 In this lesson, we will learn how to solve a system of equations by substituting one equation into the other. Find 𝑥 given 2 𝑥 − 𝑦 = 5 and 𝑦 = 7 𝑥 . Solve the simultaneous equations 𝑦 + 4 𝑥 = − 8 and 𝑦 = 5 𝑥 + 1 0 . 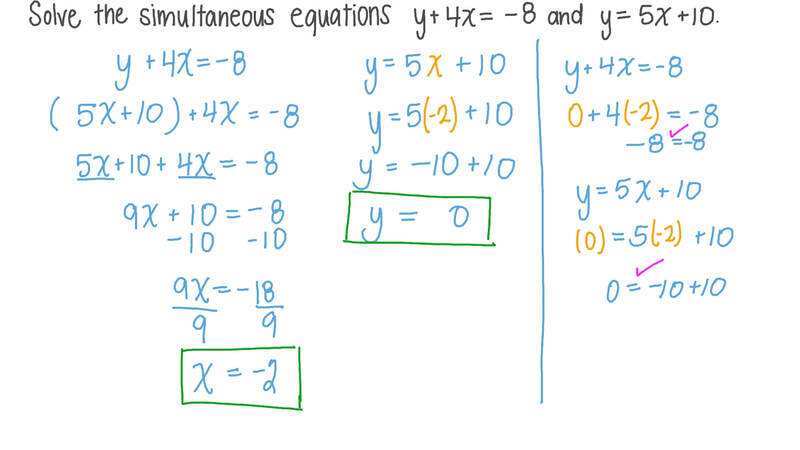 Solve the simultaneous equations 2 𝑥 + 𝑦 = 1 1 and 𝑥 − 2 𝑦 = 3 . Solve the simultaneous equations 𝑥 − 𝑦 = 4 and 𝑥 + 𝑦 = 1 4 . Shady and Maged each have a marble collection to sell. Maged has 1 more than 3 times the number of marbles Shady has. How many marbles does each boy have to sell if the total number of marbles is 113? Find two numbers whose sum is 28 and difference is 13. The difference between two numbers is 9. Twice the sum of the two numbers is 10. Find the two numbers. Solve the simultaneous equations 𝑥 + 4 𝑦 = 1 7 and 2 𝑥 + 7 𝑦 = 5 . Find the values of 𝑎 and 𝑏 , given the arithmetic mean between 𝑎 and 𝑏 is 62 and the arithmetic mean between 2 𝑎 and 3 𝑏 is 3 2 1 2 . Find the values of 𝑎 and 𝑏 , given the arithmetic mean between 𝑎 and 𝑏 is − 3 4 and the arithmetic mean between 4 𝑎 and 2 𝑏 is − 7 6 . Find the values of 𝑥 and 𝑦 , given the arithmetic mean between 𝑥 and 𝑦 is 77.5 and the arithmetic mean between 7 𝑥 and 6 𝑦 is 467. If 7 𝑥 − 4 𝑦 = 8 and 𝑥 = 4 , what is the value of 𝑦 ? Given that ( − 2 𝑎 , 8 ) = ( 2 𝑏 − 2 , 𝑎 ) , find the values of 𝑎 and 𝑏 . If 𝑥 + 𝑦 = 7 0 and 𝑥 = 4 7 , what is the value of 𝑦 ? Solve the simultaneous equations by first finding an equation in 𝑥 and then 𝑦 . If 7 𝑥 − 𝑦 = 2 1 and 𝑦 = 4 𝑥 , find 𝑥 . Solve the simultaneous equations by first finding an equation in terms of 𝑥 and then substituting your value of 𝑥 to find 𝑦 .
Karim’s father’s age equals Karim’s age multiplied by 10. If difference between their ages is 18 years, how old are they? Two integers 𝑥 and 𝑦 have a sum of 82 and a product of 1 6 8 0 . Write an equation which could be solved to find the possible values of 𝑥 . Two numbers have a sum of 56. If one number is one-third of the other, what are the numbers? A man’s age is 9 more than 2 times his son’s age. Given that the sum of their ages is 57, find each of their ages. A movie theater sold 1 2 0 0 tickets. If a child’s ticket costs $5.95, an adult’s ticket costs $11.15, and the total revenue was $ 1 2 7 5 6 , how many of each type of ticket did they sell? 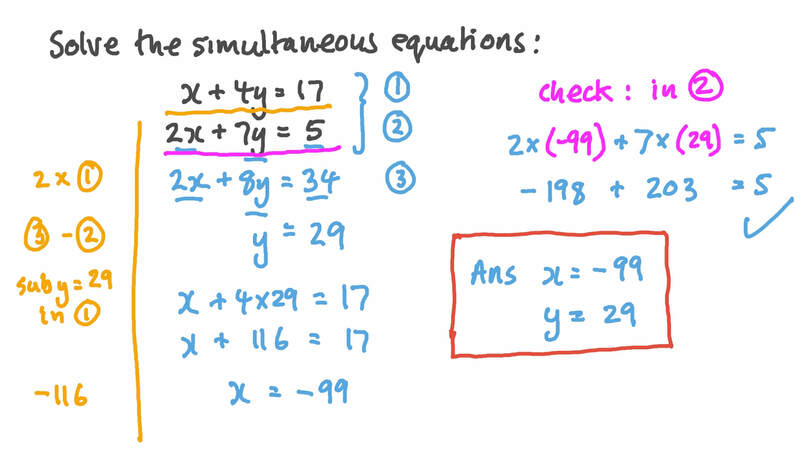 Solve the simultaneous equations 2 𝑥 − 𝑦 = 1 4 and 2 𝑦 − 3 𝑥 = 5 .